The ES-8 is a powerful and versatile effects switching system that gives you complete control over a pedalboard full of stomps. Going far beyond typical pedal-switching devices, the ES-8 harnesses BOSS’ decades of effects knowledge to fully maximize your sound-making capabilities using all types of effects, from vintage pedals to modern MIDI-controlled devices. To start, you connect your pedals to the ES-8’s audio loops, and then activate the loops as needed to achieve various pedal combinations. The on/off state of each loop (and many other things, as we’ll discuss) can be saved in a patch, allowing you to instantly change sounds without dancing around to press the switches on individual pedals. Your guitar tone is also maintained, because it only travels through an effect when it’s needed for a particular sound. Other loop switchers for pedals can accomplish the same thing. 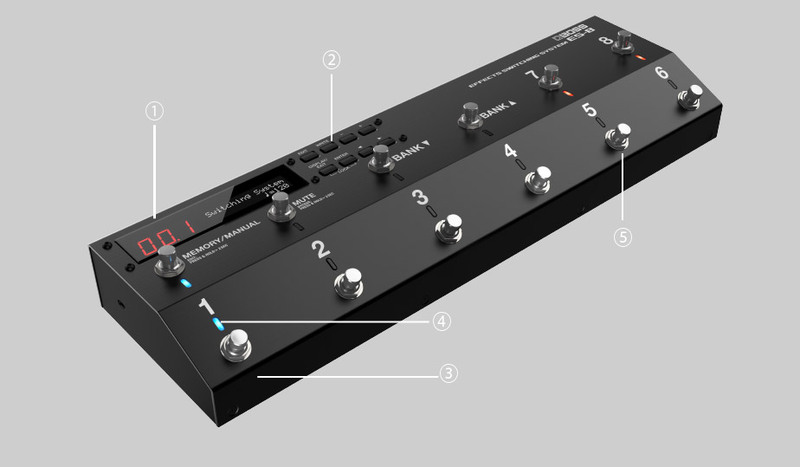 However, the ES-8 goes way beyond this core functionality, providing powerful routing flexibility, real-time control options, MIDI, and more in one comprehensive, integrated unit. This gives you unprecedented levels of control that directly bring your creative ideas to life. 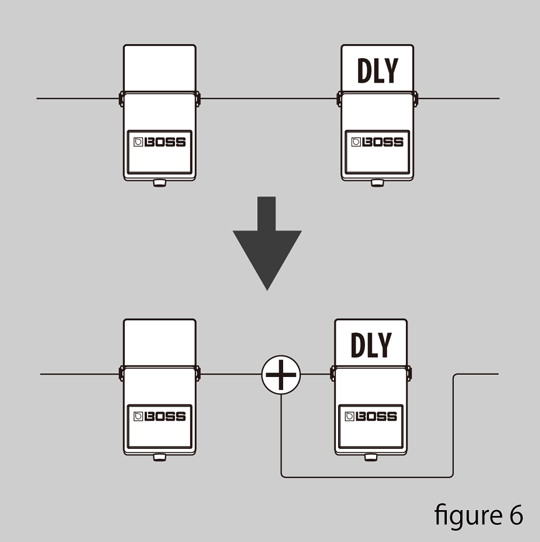 One of the main reasons guitarists use switchers is to streamline the operation of complicated effects systems. With the ES-8, “complicated” does not mean “difficult.” If you’re unfamiliar with effects switchers, the ES-8 may seem a little daunting at first glance, but its operation and concepts are quite easy to grasp with a little explanation. Read on as we show you some useful tips as follows, to get started creating new sounds with the ES-8 and your favorite pedals and amps. 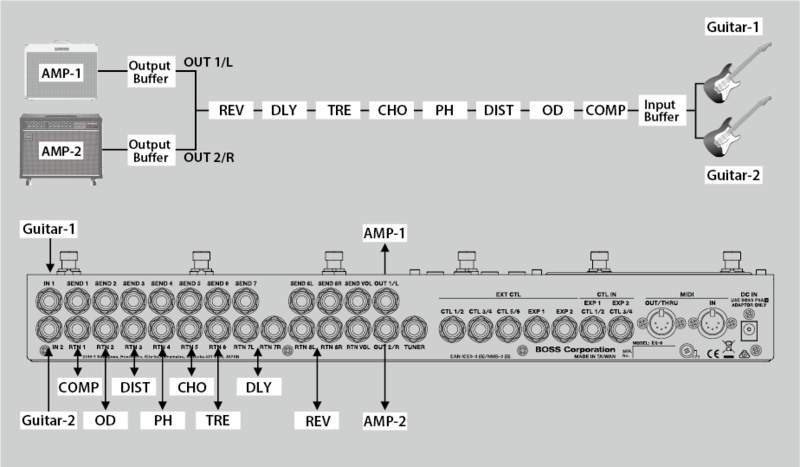 As shown in the diagram below, the ES-8 has eight analog audio loops with send and return connections. Loops 1-6 are mono loops, while Loops 7 and 8 can be used with stereo pedals. The loops are controlled by an analog switch array that provides fast, flexible, and transparent switching. When a loop is not active, your guitar completely bypasses it for clear and pure signal transfer. Separate input and output buffers are available, and these can be switched on/off individually as needed. 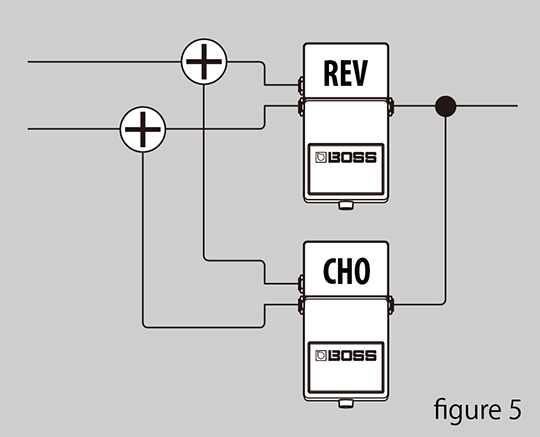 In typical pedal switchers, the audio loops are in a serial configuration, and the order is fixed. However, the ES-8’s loops can be reordered however you like and saved per patch. 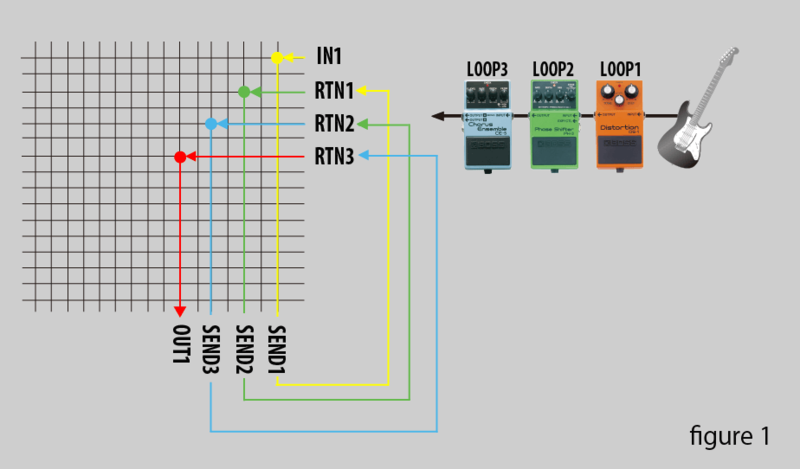 The diagram (figure 1) shows a connection example using distortion, phaser, and chorus pedals (connected to Loop 1, Loop 2, and Loop 3 on the ES-8, respectively). Using the color code on the matrix, you can easily follow the routing pattern as the signal flows from one loop to another. The ES-8 receives the guitar signal at IN 1, and then routes that signal to the distortion pedal via SEND 1. From the distortion’s output, the signal comes back into the matrix through RTN 1, where it’s routed via SEND 2 into the phaser pedal. This process is repeated accordingly for the remaining effect boxes in your setup. 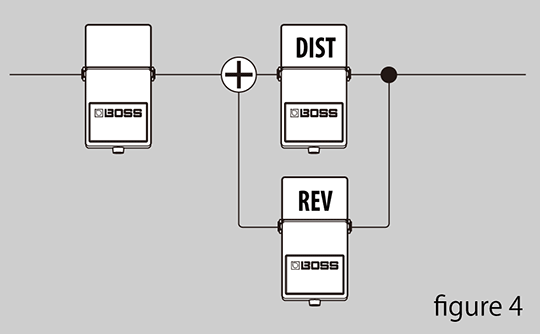 With most pedal switchers, that’s all you can do: route effects one into the next via the connected loop order. But as you can see in the next example (figure 2), you’re able to alter the ES-8’s routing pattern as you see fit. In the diagram, we’ve adjusted the sequence to make the guitar signal pass through the phaser (Loop 2) first, and then on to the distortion (Loop 1). We accomplish this by changing the initial contact terminal points on the relays, thanks to pre-existing circuitry designed by BOSS. The ES-8 includes two onboard mixers that unlock even more cool effects possibilities. First, they allow you to use effects in a parallel fashion, blending them together instead of feeding one into the other. 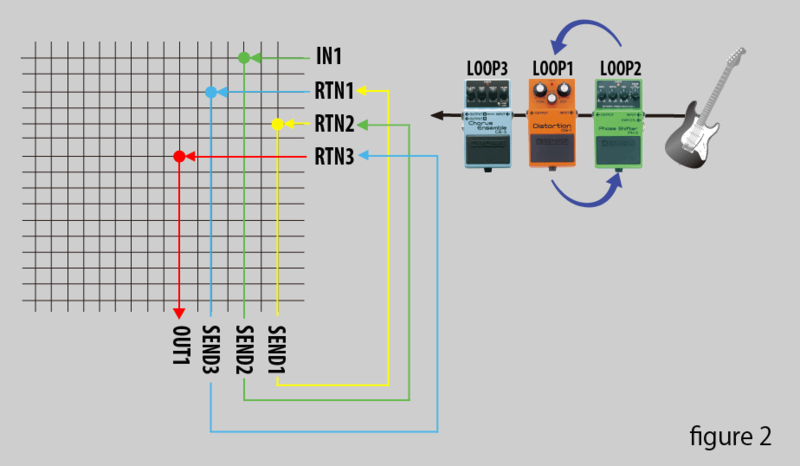 (Up to two parallel loops can be created using the onboard mixers.) This function lets you create mixed tones, such as clean blended with distortion. Secondly, the mixers allow for effects carryover when changing patches, which is particularly useful when working with delay and reverb effects. More than one effect can be connected in each single parallel chain. In addition to its eight audio loops for effects, the ES-8 includes a volume loop. Like its name suggests, the ES-8’s volume loop works great for inserting a volume pedal. This can be thought of as an “insert” patch point between the audio loops. However, unlike the fixed insert loops found on other switchers, the position of the ES-8’s volume loop in the effects chain can change, because the normal effects loops can be moved around at will. In this way it allows you to maximize the capability of your amp. 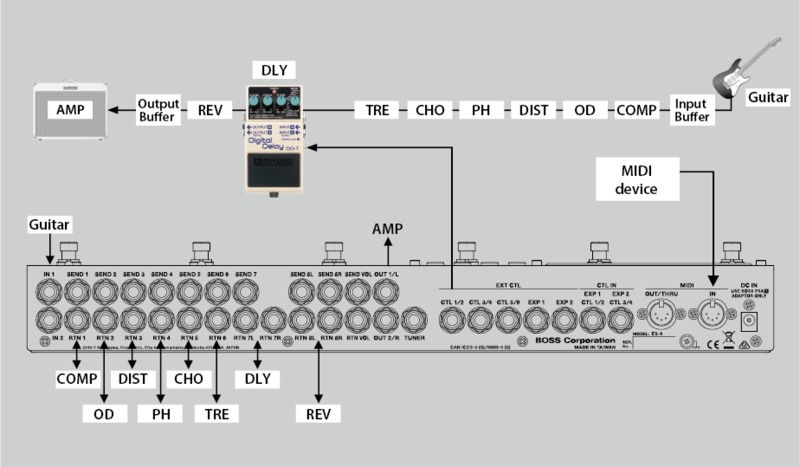 Connecting an effects system and amp together using the amp’s effects loop is often called the “four-cable method,” because the primary interconnections require four cables. (Note that your amp must be equipped with an effects loop for this application.) Using this approach, it’s common to run effects such as wah and distortion before the preamp, and effects such as chorus and delay in the amp’s effects loop. With the ES-8, it’s easy to accomplish this. By patching the ES-8 into the amp’s front panel input and effects loop, you can freely reroute effects before and/or after the amp’s preamp section to achieve the best tone for a particular sound or song. 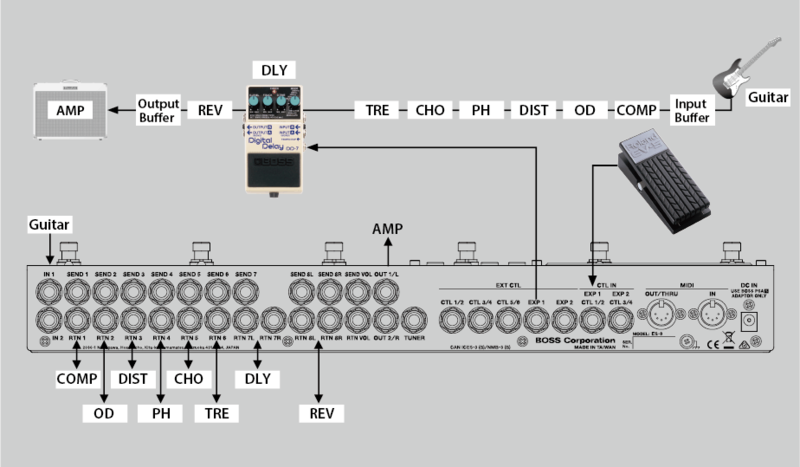 The next diagram illustrates how to connect the ES-8 and amp together using the four-cable method. The guitar signal runs through a chain of effects in the ES-8 to the SEND VOL (volume send) jack, which is connected to the amp’s guitar input. Next, the signal from the amp’s effect send jack returns to the ES-8 via the RTN VOL (volume return) jack. Finally, the signal goes from the output of the ES-8, after passing through another chain of effects, to the amp’s effect return jack. As a result of this routing, the amp’s preamp section becomes connected to the moveable ES-8 effect chain, providing another powerful routing option for creating great tones. 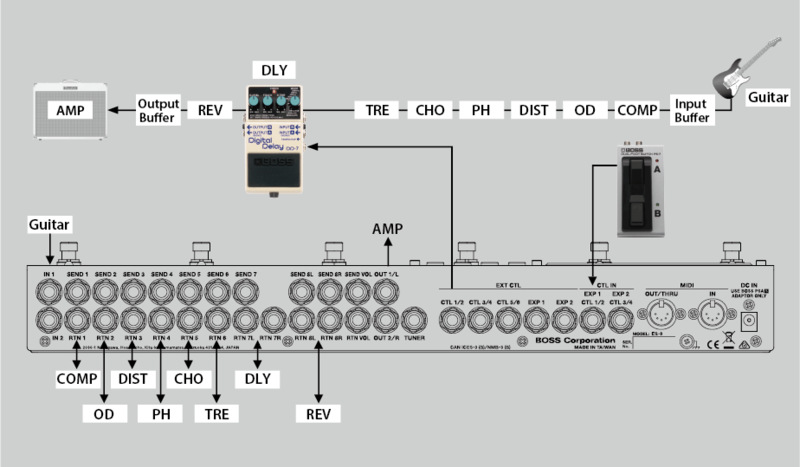 With this method, there are unlimited possibilities that can be realized by experimenting with the position of the preamp in the effects chain, allowing the amazing flexibility of the ES-8’s routing to be applied to your amp. To create a variety of sounds, you can position specific effects before or after the preamp in the chain lineup. Then, all of your desired settings can be stored in ES-8 patches and accessed instantly while performing. With its selectable inputs and outputs, the ES-8 can be used to choose among multiple guitars or amps with a single switch. The ES-8 has two inputs, perfect for connecting two different guitars. The active input can be stored with each patch and/or assigned to a footswitch for real-time control. There are also two outputs (OUT 1 and OUT 2) that can be used individually or simultaneously, and these settings can be stored with patches or assigned to footswitches as well. In the example below, let’s say that Amp 1 is set up as a high-gain amp, and Amp 2 is a clean amp. When you create effects sounds for heavy riffs or guitar solos, route these patches to Amp 1. For effects that compliment clear, transparent arpeggio styles or crisp, cutting rhythm parts, route these patches to Amp 2. Additionally, Amp 1 and Amp 2 can be mixed (OUT 1 & 2) to create a rich live performance sound similar to what is often achieved in studio recordings. In addition to its flexible audio routing, the ES-8 features numerous control jacks to remotely control external devices. In the EXT CTL section, the three CTL jacks have two output paths each, providing a total of six control outputs. Additionally, there are two EXP jacks for expression pedal control. The ES-8 also has a CTL IN section with two TRS control input jacks for connecting expression pedals or footswitches. 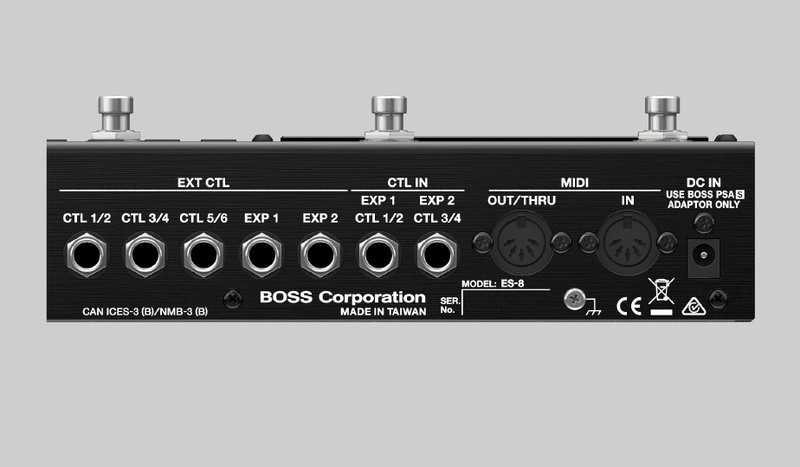 Finally, MIDI control capability is available through MIDI IN and OUT/THRU jacks. One possible use for a control jack is for connecting to a pedal with a tap tempo input, as shown below. This allows the ES-8 system to send tempo information to the pedal (to set delay times, for example). The tap tempo function can be enabled on the ES-8 with an onboard or external footswitch. Times can be stored in the ES-8 and loaded into a pedal by pulses which are sent when changing the patch. Also, the ES-8’s tap tempo function can alter the subdivision of a delay time (quarter, eighth, dotted 8th notes, etc.) to create a variety of rhythmic effects. Additionally, the CTL jacks can be set to either momentary or latch mode so that they can be compatible with any device. Controlling effect parameters with an external expression pedal is another way to make use of the ES-8’s control jacks. For example, with a pedal like the BOSS DD-7, linear control of the delay time is possible, opening up numerous real-time sound possibilities while performing. This allows the guitarist the capability to have more creative influence over his musical expressiveness. It is also possible to preset the delay time to the value on the selected patch. 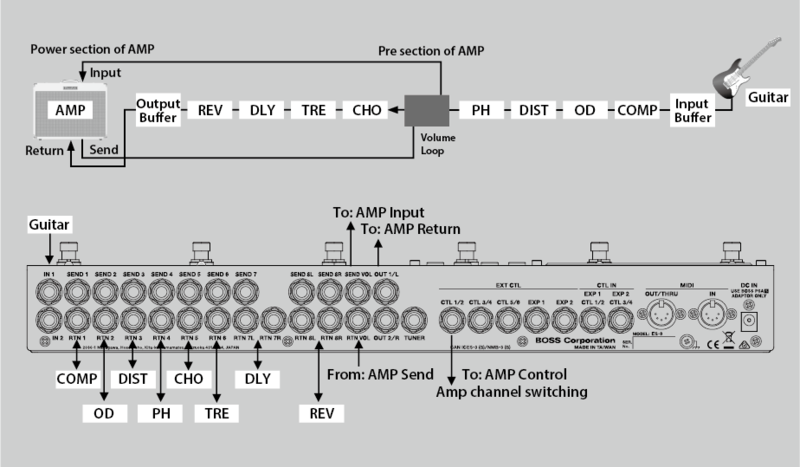 Additionally, the CTL OUT jacks on the ES-8 provide a way to remotely switch channels on a multi-channel amp. With the ES-8’s MIDI capabilities, you’re able to fully harness the power of today’s MIDI-enabled stompbox effects. As an example, you can send program changes or control changes to select patches on multiple connected MIDI devices at once, and send MIDI Clock to synchronize all the effects together with a patch change or live tap tempo. This also works with non-MIDI compatible devices by sending the MIDI clock as pulses to external control jack of the effects. The inclusion of the “Separate Loop” function can be found in many switching devices, however, in the ES-8, we have deliberately eliminated the need for this extraneous connection because it provides no extra benefit to the unique and comprehensive ES-8 design. In fact, the ES-8 was conceived with total integrated functionality in mind without the need for a detached independent output function. As a result, the eight plus one loops can be fully utilized in more flexible ways. The ES-8 already has two inputs selectable for each patch. The ES-8 already has two outputs selectable for each patch. The ES-8 already has an input buffer which can be switched on/off for each patch. 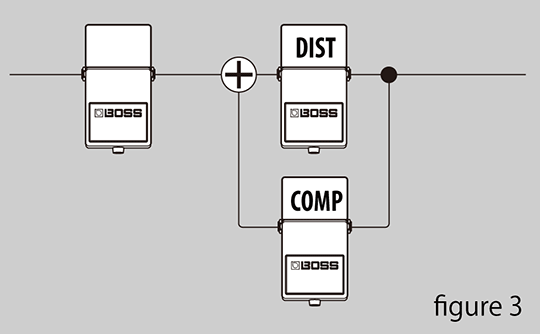 Each footswitch on the ES-8 can be set for latch or momentary operation on a per-patch basis. Latch mode is widely used for typical on/off control, while momentary mode is used for tap tempo and other dynamically controlled operations. That is to say, it is not just on/off, but the effect, for example, can be held as long as the footswitch is depressed. Compact, durable, and ergonomic, the ES-8 was designed with a conscientious awareness of the real-world needs of professional performing musicians.